Nextbase’s first 4K camera supports Wi-Fi and a simple, self-powered parking mode. Unfortunately, video quality isn’t the best, and the internal battery is prone to early failure. A reliable, highly popular little dash cam that comes with all the basics, plus Wi-Fi and GPS. Video quality is sub-par though. A single-channel dash cam that can be upgraded to dual channel. Excellent video quality and reliability. GPS. Time-lapse parking mode supported. Easy to set up and use. Top video quality in late 2018. A unique, stylish dash cam that you can easily swivel around 360 degrees on its magnetic mount and point it to the passenger’s window or to the rear when needed. Comes with GPS, Wi-Fi, and a remote lock file/snapshot button. Low heat tolerance and only fair video quality though. An easy to use single channel dash cam that can record 1440p @ 30fps and 1080p @ 60fps. Unfortunately, the camera has major overheating issues, and video quality is sub-par for the price. A tiny, discreet high-end dash cam with Wi-Fi and GPS. Outstanding field of view at 180°. Easy to set up and use. Great customer support. Video quality is not satisfactory for this price though, and camera can be prone to overheating in hotter regions. Easy-to-use entry-level dash cam. Optional external GPS. Large viewing angle and high temperature resistance. Stealthy wedge shape. Supports motion detection and time-lapse video, but no true (buffered) parking mode. A high-end, single-channel dash cam that records excellent video quality, day and night. Upgraded model of the popular SG9665GC, with a better lens and several other improvements. External GPS receiver and CPL filter included. Stealthy, elegant-looking, easy to use dash cam for around $50. No screen. Wi-Fi. Records at 1080p, but video quality isn’t the greatest. If you’re looking for a Nextbase car camera and are hoping to compare their customer product ratings on Amazon, you’ll run into an issue: All of the user ratings are lumped together, and there’s no simple way to see which Nextbase model got how many reviews, and what average rating. This article shows you an overview table of how each of the individual models rank in the customer reviews. An excellent front-and-rear dash cam for beginners and experts alike. Records top quality 1080p video footage at 15Mbps, both ways. External GPS. CPL filter included. 2″ screen for easy set up and video playback. Stealthy wedge shape. Excellent customer support. A taxi cam that records 1080p both ways, with IR LEDs illuminating the passenger cabin at night. Excellent for taxi or uber drivers. Great rear video day and night. Forward video is fair to good, with a noticeable blue tint though. Supports time-lapse and motion detection parking mode. Dual-channel dash cam that records 1080p both ways. Better night and rear video quality than all competitors (as of mid 2017). Has GPS, Wi-Fi, and buffered or time-lapse parking mode. A stealthy, 2x1080p front-and-rear dash cam with above average video quality, and for an accessible price. The Mini 0906 might be the most exciting addition to the Mini series in a long while! In 2017, BlackVue released an accessibly-priced series of dash cams that range from one-way cameras and dual-channel cams with low resolution or frame rate, to a full-fledged 2x1080p dual channel dash cam with 3.5″ LCD touch screen. Elegant, stealthy 1080p/720p front and rear dash cam that supports Wi-Fi. Video quality is fair or better except for rear night video, which is poor. Optional external GPS. Buffered parking mode with motion detection and low-voltage cutoff. Wedge-shaped 1080p dash cam that records good video at day, fair video at night. Great build quality and excellent customer support. WDR. Wi-Fi. 2.4″ screen. Simple parking mode that doesn’t require hard-wiring, due to large internal battery. A 1080p dash cam that records good quality video, day and night. Easy to install and use. Supports GPS and comes with a built-in CPL filter. 2.7″ screen. An updated version of the Thinkware X500, the X550 comes with a darker casing and supports time-lapse as well as buffered parking modes. Optional rear camera (1080p both ways). 2.7″ screen. GPS / GLONASS. Dual save. Capacitor. A reliable rear-view mirror mounted dash cam that’s been around since 2014. 1080p. Optional GPS. Excellent customer support. Intuitive to use. Clips onto most existing rear-view mirrors. A discreet, attractively designed dual 1080p/30fps dash cam with Wi-Fi, GPS, and buffered parking mode. Easy to set up and use. No screen. Capacitor instead of battery. High-end 1440p camera with best video quality yet. Replaces the DOD LS460W as our video quality benchmark. Ambarella A12 processor. HDR. Capacitor instead of battery. Time-lapse or motion detection parking modes. Optional GPS and CPL filter available separately. A reliable front and rear dash cam with a great form factor and lots of extras. 1080p front, 720p rear. Easy to install and use. Excellent customer support. Wi-Fi. Capacitor. Optional GPS/GLONASS and OBD-II modules available. Modular, great value-for-money dual channel dash cam. 1080p@30fps front and rear. Very good video at day, good at night. Integrated GPS. WDR. Capacitor. G-sensor. Motion detection. Buffered parking mode. Smallest and (so far) best dash cam of the Mini series. GPS. Wi-Fi. Parking mode. Capacitor based. Astonishingly sharp 1080p video day and night. Up to 64GB SD card supported. Magnetic mount for CPL filter. Overview of all the Mini series cameras: From Mini 0801 to Mini 0903 and beyond. What they all have in common, what the differences are, and where you can find the best price. Compare main features and prices in a handy table. Affordable, simple-to-use dash cam. Wi-Fi. WDR. 165° viewing angle. Good video quality at night, very good at day. A stealthy, wedge-shaped dash cam that ticks all our boxes: Great video quality, reliability, customer support, and user satisfaction. 1080p. GPS. WDR night vision. Up to 256GB SD cards. Optional CPL. Capacitor instead of battery. A full-featured sat-nav unit with an integrated 1080p dash cam. Good video quality at day, average at night time. 6.1″ pinch-to-zoom touch screen. GPS. Up to 64GB storage. Voice menu with voice recognition. Connects via miniUSB, Bluetooth & Wi-Fi. A highly discreet Chinese wedge-shaped dash cam with 1080p resolution. Good video quality at day, fair at night. 2.7″ screen. 170° viewing angle. Latest model of the Mini series, as usual with very good video quality day and night. Up to 1296p or 2560×1080 resolution. Optional GPS in mount. CPL filter included. Taxi cam that records high quality footage at day and at night, both inside and outside the vehicle. Resolution: 1080p front, 720p rear. Supports Wi-Fi, GPS, G-sensor. Free apps for iOS and Android. Sturdy build quality, great design. Dual channel dash cam with 1080p front and rear. 4″ touch screen. GPS, GLONASS. Large temperature resistance. Up to 512GB total storage. ODB-II support. Buffered parking mode with in-built battery discharge prevention. Front & rear recording dash cam with 1080p@30fps. Better rear/night video quality than other dual channel dash cams. 2.4″ screen. Buffered parking mode. Optional external GPS. Capacitor based. WDR super night vision. Mount for CPL filter. State-of-the-art dual channel dash cam that records 1080p, front and rear. Great video quality. Supports Wi-Fi, GPS/GLONASS, OBD-II, buffered parking mode, HDR, UV and CPL filters, and more. Downside: Large size of the front camera. High quality video up to 1296p. Supports 2560x1080p wide screen. 16 Mbps bit rate and Ultra-High Dynamic Range (HDR) ensures great video quality at night as well as at day. Optional GPS tracker and CPL filter available separately. Uses capacitor instead of battery. Downside: Large size, not very discreet due to form factor. Excellent video quality day and night. Large F/1.6 aperture. WDR super night vision. Integrated GPS. Sony Exmor sensor. High bit rate (15 Mbps). Parking mode with time lapse option. Overspeed warning. Password protectable. One of our favorites for 2015. An upgrade of the LK-7900 ACE, the Korean Lukas LK-7900 ARA has a couple of unique new features: an OBD-II interface, and up to 256GB memory support for over 48 hours of video recording. Also, the internal battery has been replaced by a capacitor. Of course it’s keeping the best features of its predecessor, like extreme temperature resistance and great video quality. Great video quality day and night. Up to 1296p resolution. Optional GPS. HDR enhanced night vision. Up to 256GB storage. Optional CPL filter. 1.5″ screen. 135° viewing angle. Very good video quality day and night, up to 1296p resolution. 2560x1080p wide screen also available. Great buy for around $100. WDR super night vision. Optional GPS in mount. G-sensor. 1.5″ screen. Supports 128GB cards. HIgh quality, user-friendly dash cam with integrated GPS. Good video quality. Large 2.3″ LCD screen. G-sensor. Loop recording. Auto on/off. Date/time/speed stamp on video. An upgrade of the DR550GW dual channel dash cam, with improved video quality and added features, and an all black casing for better stealth. Has GPS, Wi-Fi, and voice menu function. NEW: Now also has truck version (with weatherproof rear cam) and taxi cam version (with IR LEDs on the rear cam). A fairly priced dual-channel dash cam that records 1080p front, 720p rear. Very good video quality, except for the rear view footage at night, which is a bit dark. Optional GPS. Parking mode with buffered video. Voice menu. Great video quality day and night. Large F/1.6 aperture. WDR super night vision. High 15 Mbps bit rate. Integrated GPS. Excellent reliability. One of the best selling dashboard cameras for over a year now. High-end feature packed dual channel dash cam. 1080p video resolution front and rear. 4″ touch screen. Wi-Fi connects to smart phone or PC. Optional external GPS. Battery discharge prevention. Overheat protection. Automatic firmware update via Wi-Fi. 1296p version of the highly popular Mini 0801. Same exterior and still one of the smallest and most discreet dash cams available. WDR enhanced night vision. Optional GPS and internal memory up to 16GB. LDWS. Takes MicroSD cards up to 64GB. High quality video day and night, Wi-Fi support and a large angle of view (160°). Easy to set up and use, even for the technically challenged. Solid build quality. Exellent user feedback and helpful, responsive after sales support. Downsides: Medium size and not too discreet. No GPS. The 1080p version of the popular HDVR-150 rear-view mirror camera. Clips on to your existing rear-view mirror for maximum stealth. HDVR-180C also supports external GPS. Great value for money: A small and stylish 1080p dashboard camera. For less than $100, the Mini 0801 offers good video quality at a 135° viewing angle. Optionally, integrated GPS and 8 GB internal memory are available. 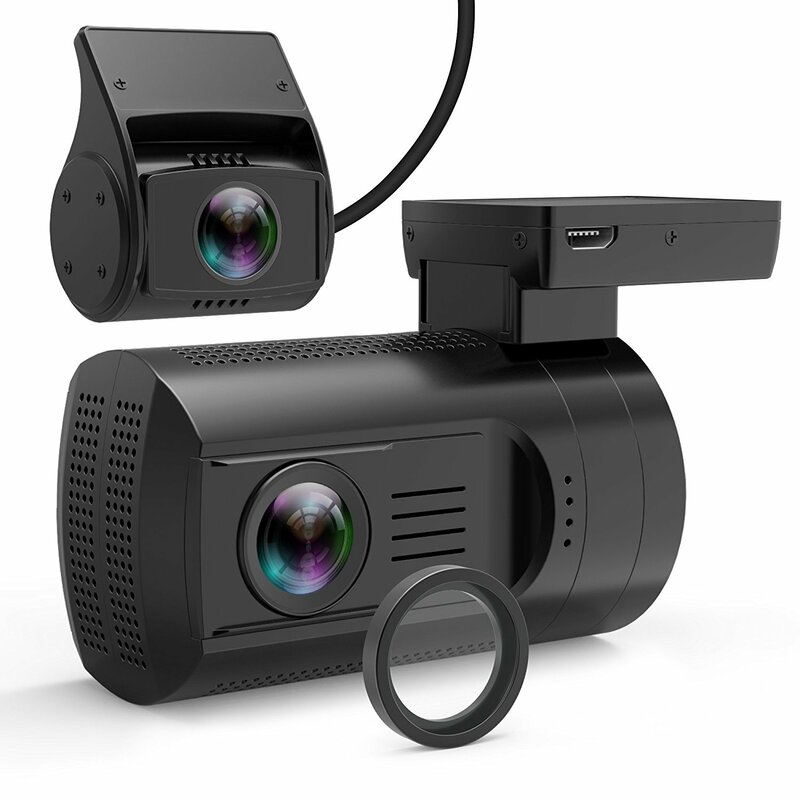 Dual channel version of the highly successful BlackVue DR500GW-HD. Records 1080p front, 720p rear. Very high video quality. Stylish design, small and discreet size. Wi-Fi connects to smart phone for easy video viewing. GPS included. The Vico-TF2+ Premium features great video quality day and night. Large viewing angle of 160°. Very heat resistant due to large casing (up to 75˚C/167˚F). 2.4″ screen. No GPS and the rather taste-dependent form factor are the main drawbacks. A very popular, small and discreet, high quality dash cam. Supports up to 128GB memory card and can withstand very high temperatures up to 90˚C. CPL lens available separately to reduce reflections. GPS. Great night vision: The LS300W is one of the best dash cams currently available. Featuring high quality video no matter whether it’s day or night, thanks to its large aperture, high bit rate and WDR Super Night Vision. Small and discreet. The ABEO HDVR-150 is a super discreet mid-price dash cam that integrates perfectly with your existing rear-view mirror. Resolution: 1280×720. Stylish and discreet, the BlackVue DR500GW has great video quality day and night. Watch your video footage on your smart phone via Wi-Fi. Large angle of view. GPS. High temperature range. Excellent reliability.